Cyber attackers are going phishing in your network pond. Learn how you can keep your people from taking the bait. Nowadays there are as many ways to communicate as there are things to say. Even so, email continues to be the primary method to connect with others, and the preferred vector for cyber-attacks. The latest threat targeting higher learning institutions comes from Business Email Compromise, an emerging but sophisticated cyber-attack consisting of low-volume campaigns of highly targeted phishing emails. 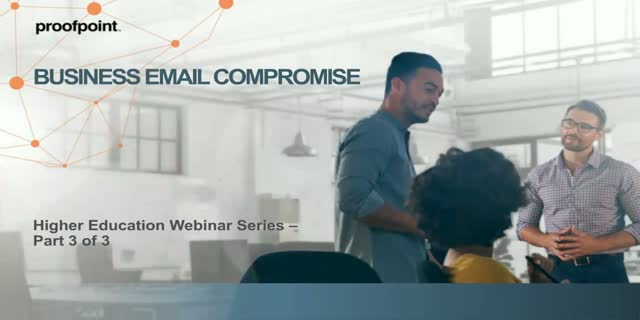 In part 3 of our three-part Webinar series, we’ll take a deep dive into Business Email Compromise and explore the various approaches attackers are using to execute campaigns targeting higher education institutions. You’ll learn the indispensable tactics you need to protect your higher learning environment from Business Email Compromise phishing attacks. Register Now.